Okieladybug's Scrap N' More: The last of the Diva's!! At least for a little while!! With this card I have completed 6 sets of 12 different Diva Va Voom cards. When I started making these I thought I would just do one or two of the Diva's but then I became hooked! And believe me, I do want to make more...just because they are just too darn stinkin cute! This one didn't have a whole lot of work into it, nor did it have any Cricut. But I still like it, but it's not my favorite. So far the Dance one has been my favorite. The patterned paper is Bo Bunny, the punches and sentiment are Stampin Up!, the border is a Martha Stewart border punch. 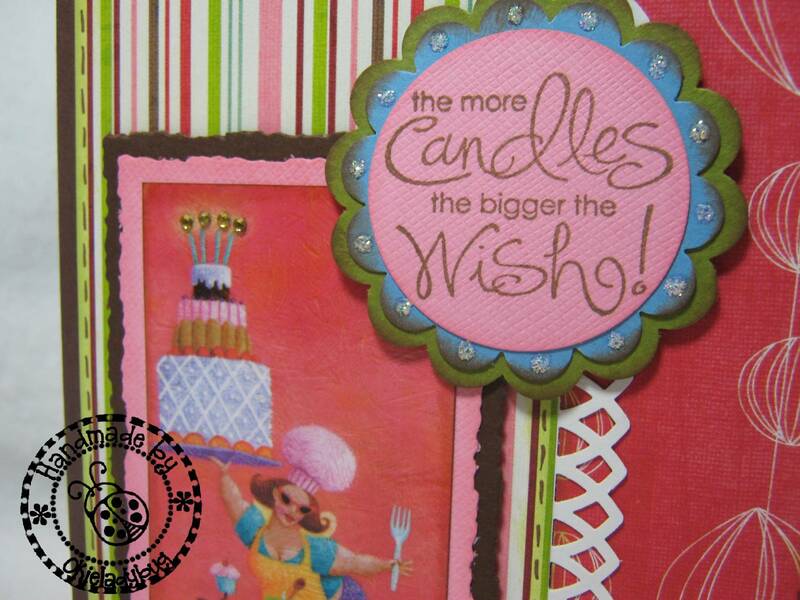 As you can see in this close up picture I used some 2mm hot fix gems for the lights on the candles. I also added some diamond Stickles to the scallops on the blue scallop circle. 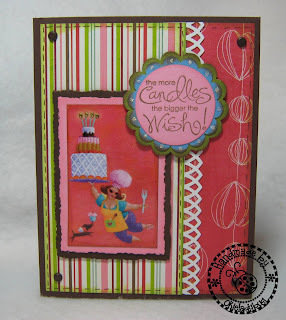 I used the deckle edge blade on my Purple Cows Trimmer to do the image mats. I seem to always forget about that trimmer these days! I do need to get some replacement blades but always forget to look for some when I am in the city. The deckle is my favorite of the blades with that trimmer. Well I hope you guys enjoyed the Diva Va Voom series! Now I have to think of what I can start on next! I can see why you got hooked. It is very cute. Cute as always. I am so jealous of all the cards you have made in this series. You are set to go for a very long time. They will really make great gifts! 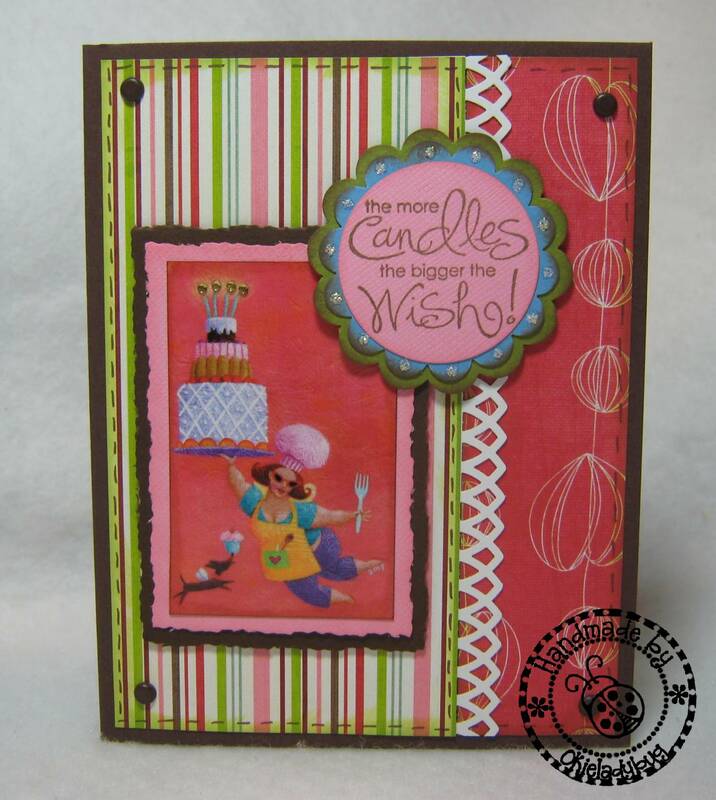 I love the card, and it makes me feel good because I add another candle to my cake today. These have been great! I can't wait to see what's next! Thanks for sharing with us! Last of the Divas??? Oh NOOOO ... now that is sad ... I've really enjoyed seeing the lovely cards you've created from these ladies of "substance". *wink* Seriously, I didn't like them at first ... but with your creative talents, they have become delightful cards. I love them all! Ha, I love this card!